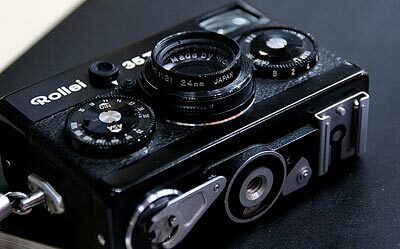 The top of a FED-2, a Russian rangefinder. In 1988, Minolta created a new mount for the Maxxum 7000i film SLR, the iISO hotshoe. This was inherited by Konica Minolta, and then Sony. But why, Minolta, why change? The standard ISO hotshoe tended to be overtightened or loose (hence slipping out sometimes.) The iISO hotshoe mount had a button for quick release. Okay, so I found a great photogeeking blog. Herbert Keppler talks of shoes. Minolta was also first with wireless flash (so Nikon CLS proponents, quit asking me “does yours have wireless flash?“) though I cannot tell you which is better, as I’m not into flash photography. From this post, I suspect that my Cosina 19-35mm F3.5-4.5 Pentax KAF mount lens was in that list too, because it looked just like the Vivitar. If Vivitar is Cosina, then my Olympus OM-2000 (actually designed and made by Cosina) with Vivitar 24mm F2.0 lens (or Cosina) could’ve come out of the same factory! And now, for a slightly off-tangent ponderance: If Hoya bought Pentax (now Hoya Pentax HD), does this mean they’re likely to be bought by a consumer giant? (e.g. Sony buying Konica Minolta) Hmmm. Which consumer giant doesn’t have a digital SLR out? I eagerly await the day, if it happens, but pity the shallow “I will hate this camera because it’s Microsoft” and totally disregarding the Pentax legacy. Imagine being able to hack into the firmware and making your own exposure algorithm, your own continuous auto-focus tracking, your own noise reduction, making every button customizable, and even playing Solitaire on it using the keypad! I don’t think of my Sony A100 as a Sony product. I think of it as having the genetics of those great Minoltas of yore, with some cult-like Minolta lenses (of yore), which I will divulge in, in another post. Also, the Konica Minolta 7D is very well regarded among those who have it. Now, for more camera pr0n. This M39 screw mount lens was on the FED-2; back then they’d measure lens focal length in centimeters! So yes, it’s a 50mm F2.8. 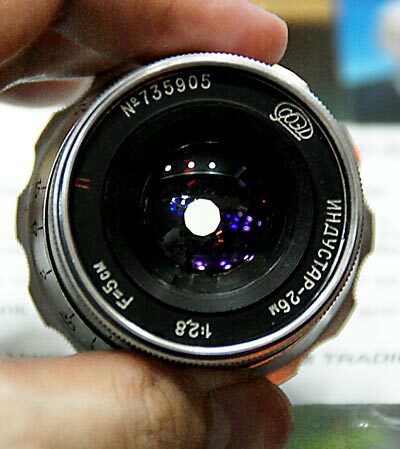 Turning the focus ring to infinity would move the rear element’s holder into the camera mount, pushing a lever on the camera, and adjusting the rangefinder image. Side-by-side with my Olympus OM-2000. 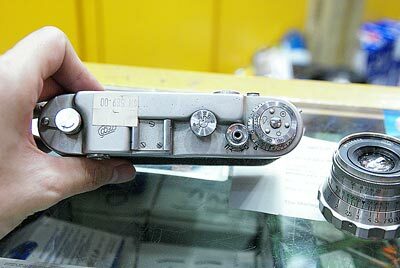 The bottom of a Rollei 35 TE, found in Ampang Park. Petite collapsible-non-interchangeable-lens rangefinder! Aperture and shutter speed dials were to the side of the lens, and working ISO hotshoe underneath. The Rollei, ready to roll. Note the 24mm screw thread on that 40mm F3.5 lens! “A revolution within the revolution. When used with the OM-2, the T-32 doesn?t have to rely on a sensor built into the electronic flash. The camera reads the light that hits the film and turns the electronic flash (or flashes) off when enough of that light has reached the film. Taken from Maitani’s Advertisement. He makes me wanna drill an air damper into my Olympus OM-2000 for quieter shots! Also check out TTL Direct (OTF) Light Measuring and the 1-inch-thick 50mm F2 lens! This entry was posted in Geek, Pictures on January 20, 2007 by 2konbla. Weren’t you supposed to help me check the price of the A540 and the A710IS for me? I need to know so that I can compare prices of them here as well. 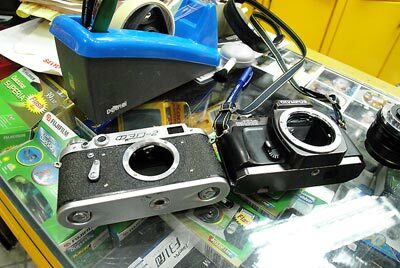 wooo….24mm screw threads should be darn rare now…haha.. the rollei actually looks cute..but is this model relatively new? 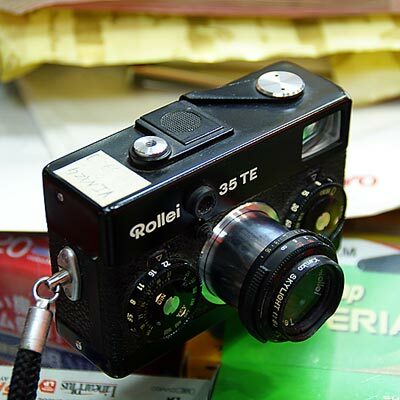 The rollei is cool, but yeah it is a relatively new one (made in Singapore). I prefer the older ones, all silver. Their twin lens cams and 6×6 are nice too.